As I have described, I have historically not excelled at athletic activities - or at regular exercise. 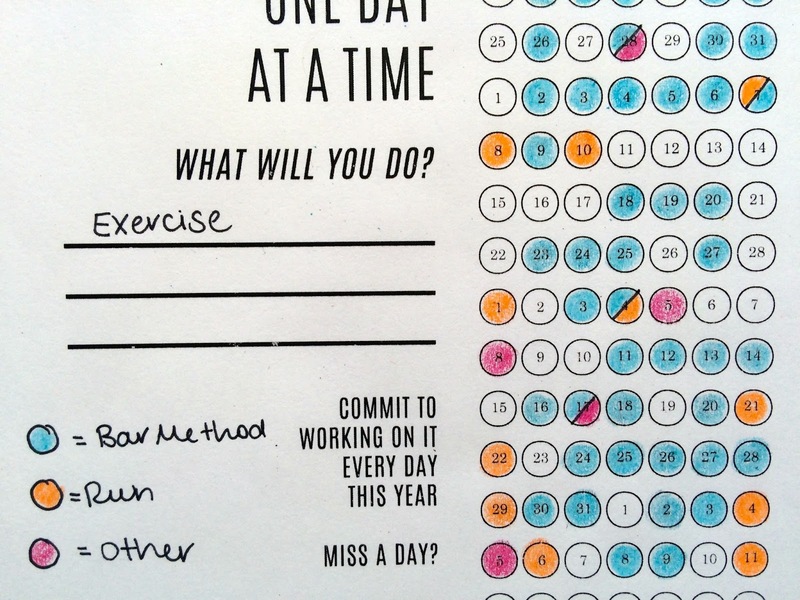 Nowadays, I go to Bar Method five days a week on average and I get my 10,000 steps and I go jogging a couple times a week and somehow, signing up for a 10k in May turned out to not be a huge mistake despite my misgivings. So to be clear, this is not a story of how I went from a couch potato to an ultra-marathoner. It is more the story of how I went from basically not exercising at all to developing a regular, sustainable exercise practice. So this will probably be deeply unimpressive to many. But I came up with a few helpful tips and tricks along the way that may help you too. Long story short, I got from point A to point B through a series of incremental, manageable goals. Phase One is the failed goal. 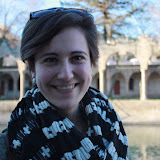 Back in spring 2013, when I wasn't exercising regularly, I had the brilliant idea to do what I was going to call "mile-a-day May" - a springtime version of the Thanksgiving-to-New-Years running challenge I had seen a favorite blogger, Elise, take on. When May 1 rolled around, I planned to hit the treadmill at my office gym... only to realize that I didn't have access and had to go through a multi-day process to get one. Womp womp. I don't know why I didn't run outside (though it probably had something to do with living in a slightly sketchy neighborhood at the time), but I basically gave up at that point. Because if you are doing a daily challenge and you miss the first day, it's hard to motivate yourself to pick up and keep going. In retrospect, it's clear why that challenge failed. It would have been a huge routine change. Of course I failed at running every day after running never. If I had been serious, I could have done much more to set myself up for success - I could have bought new running shoes and made sure I had gym access and developed a real strategy - but I still don't think I would have succeeded at doing it every day. Later that summer, I started craving a massage. But I figured that any physical ailments I had from my sedentary desk job could be cured more cheaply with exercise than with a massage - and, if anything, working out might give me some aches and pains that I could then justify alleviating on the massage table. I set myself a challenge: I promised myself that if I worked out three days a week, for 12 weeks, I would reward myself with a massage at the end. Doesn't sound too hard, right? It still managed to take me about twice as long as I thought it would. (I didn't start back at zero when I missed a week, I just continued again the next week.) I would typically go to yoga Tuesday (the only day the closest studio had a Vinyasa class at a time that worked for me), run on the treadmill at my office Thursday, and run outside on the weekend. But that schedule was easily disrupted by happy hours and bad weather. I eventually made it through, got my massage, and was pretty pleased with myself. In January 2014, after encountering lots of buzz about barre classes, I started doing Bar Method near my work. I signed up for monthly unlimited classes since it seemed like the best deal - and that totally changed my exercise calculus. Because when you are paying $$$ for unlimited classes on a nonprofit salary, you have a pretty strong incentive to go as often as possible to reduce your cost per class and prove to yourself that it is worthwhile. Charting my progress made me see that every work out was worth it. Seeing that it was worth it kept me going. Continuing to go resulted in pounds lost. Seeing those results made me want to run even more. Running even more made me stronger. Being stronger made is so I didn't want to die while running. 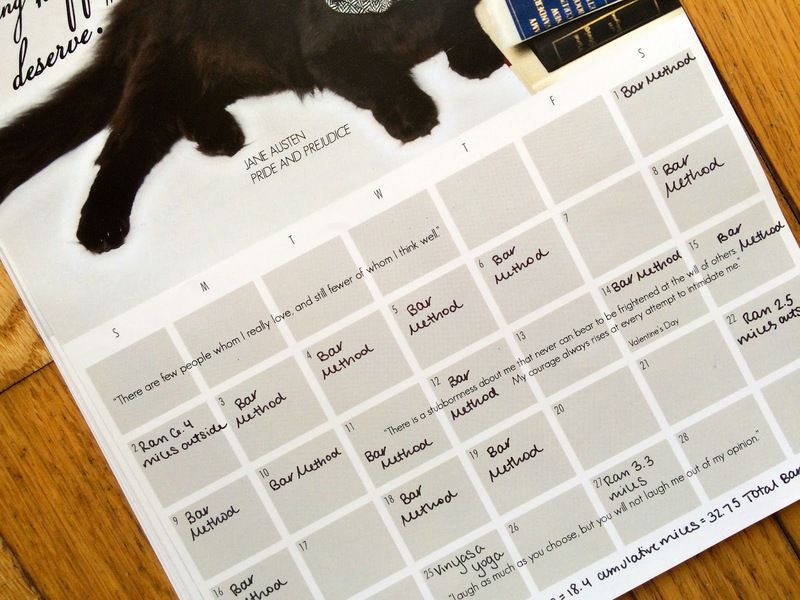 In 2014, I tracked workouts and mileage on a fabulous cat literary calendar from Sarah Von Bargen. 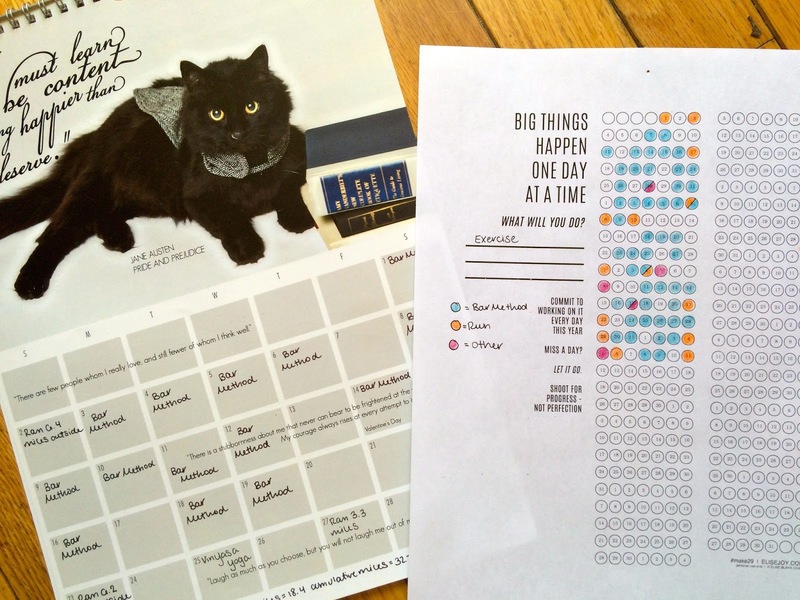 And this year, appropriately enough, I am doing it on a daily goal tracker from Elise and logging mileage separately. I'm not shooting for every day or even for a certain number of days a week, but it's still satisfying to watch the bubbles fill in. So there you have it. Nothing especially exciting - but I do consider developing a regular exercise practice to be one of my big, if intangible, accomplishments over the past few years since graduating college. I am so hopeful that, while the particulars may change, this is something I'll be able to stick with as my life gets more hectic when I eventually return to school - and, really, for the rest of my life.